One more time we find ourselves at the beginning of another Church Year. Advent is almost upon us shortly followed by Christmas. May we live this Season truly, not as the secular world does, in sales, early morning shopping, over the top consumption. May we live it truly, deeply and may this season of preparation not leave us unchanged. In this time of year, American consumption becomes a Civic Virtue, and complaining about some seasonal temp at the mall wishing us "Happy Holidays" rather than "Merry Christmas" makes all the greed, pushing, and stress "Christianized" I suppose. Try to reach above the shopping pressures and connect with the sense of preparation, just Who are we getting ready for? That is a quote from Rev Scott Jones, that was in a posting from last year and I wanted to share it again, since it really made me think. So many people wonder just what does the Kingdom look like? We ask each other, and try to model different things, however every so often shouldn't we just look to the King Himself? 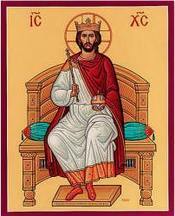 Jesus modeled Kingship over His community in a way so unlike the Kings humanity has produced. Servant leadership isn't something that we humans take to without a clear and compelling Example. So this Sunday, while we again think of how the Kingdom hasn't come in it's fullness, lets look begin to anticipate it once again, by looking only to the Wounded, Servant King. Yes I have decided to join the growing number of people that are making a distinction between Christians (followers of Jesus) and Christianists (those who use Christianity as a political force). It seems that now the Christianists are out there burning Churches they don't agree with. Sure they will break in and rescue the BIBLES, before they burn the buildings, since we can't let the Word of God be insulted. 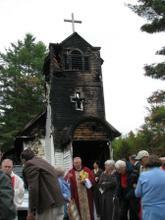 Christ Church, Episcopal was burned after being robbed of Bibles, read about it here. Caleb Uriah Lussier of Plymouth, Mass., is a student at the Word of Life Bible Institute. Lussier confessed to removing the Bibles out of Christ Church and setting fire to it as at least one other Church. He also appears to have sent threatening letters to three churches in Plymouth, Mass. Just what do they teach there at "Word of Life"? Is is a faith of love and self service to humanity or one of hate and attacking those who differ. Any place can attract a weirdo, but it seems to me that the Right wing of the Christianists is getting more and more dangerous as time goes by. So is this what the Christian Right is coming to? Home grown Terrorism? I don't see the gentle Shepherd from Nazareth at all in this act of arson. What would Jesus do? He already told us what to do. Pray for them that despitefully use us. † God, the Father of all, Whose Son commanded us to love our enemies: Lead them and us from prejudice to truth; deliver them and us from hatred, cruelty, and revenge; and in Your good time enable us all to stand reconciled before You; through Jesus Christ our Lord. Amen. I have a place to sit comfortably. I always light candles, sometimes I burn incense (from a Trappist Monastery). I have an Icon of the virgin with a votive in front of it, that is usually burning. I have found that intentionality is the core of how to practice this, at least for me. Basically it comes down to this. Invite the Holy Spirit to bring the gift of God's Presence. Br. Thomas Merton says that this type of prayer is not just for Monks, or Nuns but any person can do it. Certainly, in the pressures of modern urban life, many will face the need for a certain interior silence and discipline simply to keep themselves together, to maintain their human and Christian identity and their spiritual freedom. 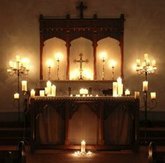 Soon we will be coming upon the season of Advent, a time to prepare our hearts for the coming of Christ. But I have a question. When you pray, do any of you take some time to prepare your heart/mind/body to focus on God? Are there any breathing or body exercises or positions you assume to help you to focus on the Divine? Does anyone take the time to prepare to enter into God's Presence or do we rush in with no thought of the Sacred place we are going? 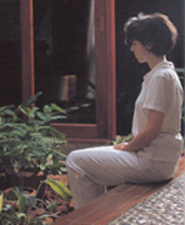 In my Contemplative Prayer group we have learned some of these techniques to help us focus on God and I am wondering what anyone else might be doing. 1. First you must learn to pronounce the city name. It is "TULL-SA" and it does not matter how people pronounce it in other places. 2. Tulsa has its own version of traffic rules. Never forget that downtown Tulsa is composed entirely of one way streets. The only way to get out of the center of town is to turn around and start over when you reach the river. 3. All directions start with, "Go down Memorial"
4. Memorial has no beginning and no end. 5. The 8:00am rush hour is from 6:30 to 9:30am. The 5:00pm rush hour is from 3:30 to 6:30pm. Friday's rush hour starts on Thursday morning. 6. If you actually stop at a yellow light, you cannot be from Tulsa. If you don't slow down at a yellow light, you are from Tulsa. 7. Sapulpa Road can only be pronounced by a native, so do not attempt the phonetic pronunciation. People will simply tilt their heads to the right and stare at you. 8. The falling of one snowflake causes all traffic to immediately cease. Fortunately all schools, businesses and city government close when the word snow is mentioned. 9. Construction on the Broken Arrow Expressway is a way of life and a permanent form of entertainment. In fact, construction on the BA will not be completed in your lifetime. 10. Many bizarre sights can be explained simply by uttering the phrase, "Oh, we're in Brookside"
11. Construction crews aren't doing their job properly unless they close down all lanes except one during rush hour. 12. If someone actually has their turn signal on, it was probably left on at the factory where the car was made. 13. The only city where a church of 2,500 members is considered a small, but quaint church. Your arrival gate is at least 32 miles away from the Airport parking. 15. Never honk your horn at another car in traffic. Native Tulsans don't like that. The bumper sticker that reads "keep honking, I'm reloading" is considered a fair warning. 16. Exit and entry ramps on the expressway are just the recommended way of entering and exiting, feel free to exit at any grassy point you wish. Everybody does. 17. 90% of drivers trying to make a left turn on Harvard, Yale, or Sheridan are actually attempting suicide. Stay out of their way. 18. Those orange traffic cones are considered by many citizens to be the designated "City Tree" of Tulsa. They are replaced, however, after nine or ten dents. 19. Remember that you may be rear-ended if you decide to yield at a "Yield" sign. 20. Be sure to take something with you to read while waiting in the 45 minute line at any of our convenient, efficiently run Post Offices. So often there have been conflicts in the Body of Christ about how we are to do things, or how someone's gifting fits into the overall "scheme" of things. Today we celebrate Leo the Great, Bishop of Rome. 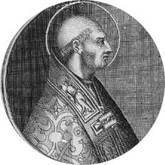 After the Roman Government withdrew from the area, he took over responsibility for the people of the city and region, and this became the basis for the later Papacy's growing temporal power. I wanted to give you a quote from a sermon by him that speaks to our place in the world. I thought it was very powerful. Although the universal Church of God is constituted of distinct Orders of members, still, in spite of the many parts of its holy body, the Church subsists as an integral whole, just as the Apostle says: we are all one in Christ. . .
Long ago, before the Christian Right, TV politics, or talk Radio, there were in the fourth century of the Christian Era, the first groups of men who chose to leave their lives behind and become hermits and Monks in the deserts of Egypt, Arabia, Persia and the Levant. They had many reasons to abandon the pagan cities of the Empire for a more pure, devoted life, but the single impulse they appear to have had in common seems to be a quest for "salvation." They felt they had to separate themselves from the corrupt society they saw around them. Apparently the ancient version of MTV, "Jackass" or perhaps "Desperate Housewives" was more than they could bear. They are referred to generally as the "Desert Fathers" and have left books of wisdom behind for us to benefit from. With the Rev.Ted Haggard story so much in the news, I wanted to share one of those pearls of wisdom. That my friends is as powerful an image of Church/Monastic discipline as I have ever heard. How powerful it would be if today's spiritual leaders would leave with those who are cast out, and walk with them as the sinners we all are. This is a powerful statement of love overcoming law and so very much like the Christ I see in the Gospels. As an aside, Here in Tulsa it seems that ORU as erased Rev. Haggard from their website. I ran across a post that gives a video (profanity warning in the video, it is for grownups) and screen shots of the process of ORU "disappearing" Rev. Haggard from their Alumni page. Justin (the guy from the video) says that Rev Haggard will find out about "Christians like this who only are your friends in good times and want nothing to do with you in bad times." How Soviet. 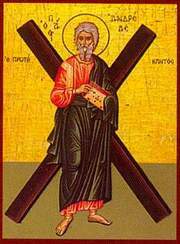 How unlike the Desert Fathers, but far worse, how unlike Jesus, Who never leaves us to despair. I know that there are some indications that Dr. James Dobson, et. al. will be helping Rev. Haggard in his time of need. I certainly hope so! May God continue to have mercy on Ted, his wife and children. May God be with those who may have been wounded by this experience, and may God have mercy on us all. 1 "Do not judge, so that you may not be judged. 2 For with the judgment you make you will be judged, and the measure you give will be the measure you get. 3 Why do you see the speck in your neighbor's eye, but do not notice the log in your own eye? " For a long time I have been an advocate of pointing at my own sins (and those of my own groups/church/party), than obsessing on those of others. I think that Jesus taught that method in the Gospels, and I feel inviting someone to walk along with you on your spiritual journey works so much better than lambasting them for their evil. Is there a spiritual dynamic a work here? There just might be. It does seem that, in fact, Rev. Haggard is getting a similar judgment to the one he has been giving for these many years. Actually it seems much of the Conservative religo-political establishment have been shaken recently with just this sort of judgment coming against those who have been the loudest to proclaim moral superiority. At the same time, I don't think the Democrats will have as huge a victory as many expect on Tuesday. I hear from so many of my Evangelical friends that, while disheartened, they will relentlessly make their ways to the polls and grimly vote Republican. In his last sermon, Rev. Haggard opened with this prayer. "“Heavenly Father give us grace and mercy, help us this next week and a half as we go into national elections and Lord we pray for our country. Father we pray lies would be exposed and deception exposed." Do we truly want such a prayer answered? I don't, I want the Grace & Mercy Rev. Haggard mentioned- not the Justice I deserve. The big question is, are we willing to extend Grace and Mercy to those we deem unworthy? Almighty God, Father of our Lord Jesus Christ, Maker of all things, Judge of all men; We acknowledge and bewail our manifold sins and wickedness, Which we, from time to time, most grievously have committed, By thought, word, and deed, Against Your Divine Majesty, Provoking most justly Your wrath and indignation against us. We do earnestly repent, And are heartily sorry for these our misdoings: The remembrance of them is grievous unto us; The burden of them is intolerable. Have mercy upon us, Have mercy upon us, most merciful Father; For Your Son our Lord Jesus Christ's sake, Forgive us all that is past; And grant that we may ever hereafter Serve and please You In newness of life, To the honor and glory of Your Name; Through Jesus Christ our Lord. Amen.